Vladimir Putin’s spokesman says the Russian president has no reason to doubt the Chechen leader’s assurances that there’s no persecution of gays in his republic, despite reports by a respected Russian newspaper of a roundup of gay men there. Spokesman Dmitry Peskov also told journalists Thursday that investigators have found no evidence to back up reports by the Novaya Gazeta newspaper this month that police in the predominantly Muslim republic in southern Russia rounded up more than 100 men suspected of homosexuality and that at least three of them were killed. Putin met late Wednesday with Chechen leader Ramzan Kadyrov, who in the televised portion of the meeting suggested Putin should not believe the “provocative” reports. The reports, however, have been taken seriously by the U.N. High Commissioner for Human Rights and prominent international organizations, which have urged the Russian government to investigate. Elaborating on Wednesday’s Kremlin meeting, Peskov said the Chechen leader told Putin the reports were “slanderous” and had angered many Chechens, but that journalists should not feel threatened. 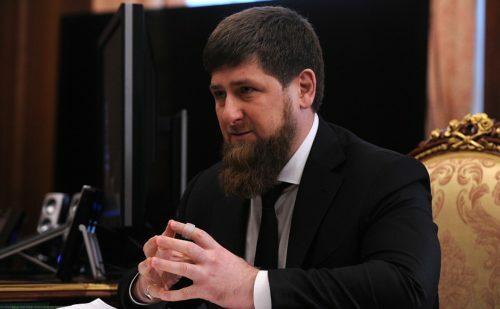 Novaya Gazeta has said it fears for the safety of its journalists after threats were made during a large gathering of elders and Islamic leaders in Chechnya. “Kadyrov’s confirmation that everything will be done within a legal framework was of course approved by the president,” Peskov said. Anna Politkovskaya, a Novaya Gazeta reporter who built an international reputation with her reports on abuses in Chechnya, was shot dead in Moscow in 2006.